Hardcover, 9.75 x 11.5 in. / 280 pgs / 250 color. By Emily Braun. Contributions by Megan Fontanella, Carol Stringari. 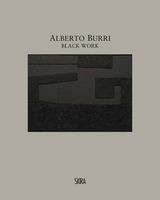 Published to accompany a major retrospective exhibition--the first in the United States in more than 35 years and the most comprehensive ever mounted--this title showcases the pioneering work of Italian artist Alberto Burri (1915-95). Exploring the beauty and complexity of Burri's process-based works, the exhibition positions the artist as a central and singular protagonist of postwar art. 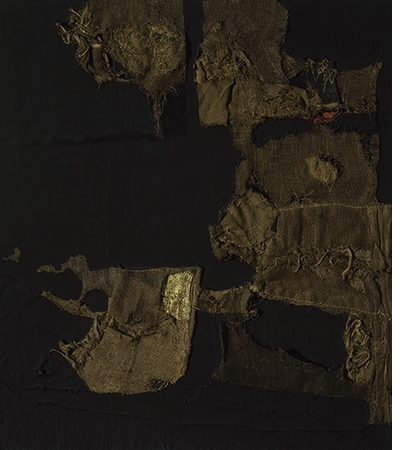 Burri is best known for his series of Sacchi (sacks) made of stitched and patched remnants of torn burlap bags, often combined with fragments of discarded clothing. Far less familiar to American audiences are his other series, which this exhibition represents in depth: Catrami (tars), Gobbi (hunchbacks), Muffe (molds), Bianchi (whites), Legni (woods), Ferri (irons), Combustioni plastiche (plastic combustions), Cretti and Cellotex works. 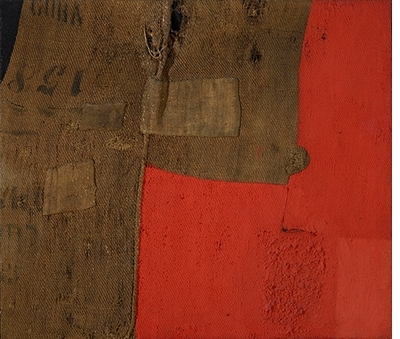 Burri's work both demolished and reconfigured the Western pictorial tradition, while reconceptualizing modernist collage. Using unconventional materials, he moved beyond the painted surfaces and markmaking of American Abstract Expressionism and European Art Informel. Burri's unprecedented approaches to manipulating humble substances--and his abject picture-objects--also profoundly influenced Arte Povera, Neo-Dada and Process art. Alberto Burri was born in Italy in 1915. He first garnered attention in the US in the early 1950s when his work was included in the group exhibition Younger European Painters at the Guggenheim Museum and was also shown at the Frumkin Gallery, Chicago, and at the Stable Gallery, New York. In 1977 a retrospective was presented at the University of California's Frederick S. Wight Gallery, Los Angeles, and traveled to the Marion Koogler McNay Art Institute, San Antonio, Texas, and the Guggenheim Museum (1978). He died in Nice, France, in 1995. 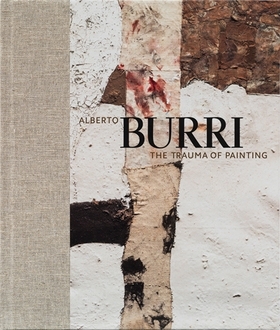 Featured image is reproduced from Alberto Burri: The Trauma of Painting. [Alberto Burri: The Trauma of Painting] reveals how the artist succeeded in deconstructing Western ideologies and, in that process, devised a singular language of his own. 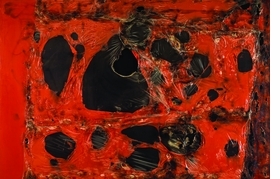 In a dazzlingly researched, often eloquent catalog essay, Emily Braun, an art historian who oversaw the Guggenheim show, “Alberto Burri: The Trauma of Painting” (and is also curator of the Leonard A. Lauder Collection of Cubist Art), argues that Burri’s art is a crucial, underacknowledged link in the development of collage and assemblage and helped set the stage for a host of postwar art movements—Neo-Dada, Process Art, Arte Povera and more. ...the catalogue accompanying the exhibition is a lodestone of information about Burri. Not only has Emily Braun, who supervised this exhibition, unearthed a wealth of information, but she has also written a substantial essay, “The Trauma of Painting,” that is wonderfully absent of academic jargon and hyperbole, making it a pleasure to read. By Massimo Di Carlo, Laura Lorenzoni. Edited by Bruno Cora. FORMAT: Hbk, 9.75 x 11.5 in. / 280 pgs / 250 color.